I remember devouring “The Maze Runner,” about four years ago when I first bought my Nook. I read the first two books in the series and then got distracted by other young adult novels. I’ve since attempted to read “The Death Cure,” but I’m having a hard time getting into as I can’t remember anything from the other books. 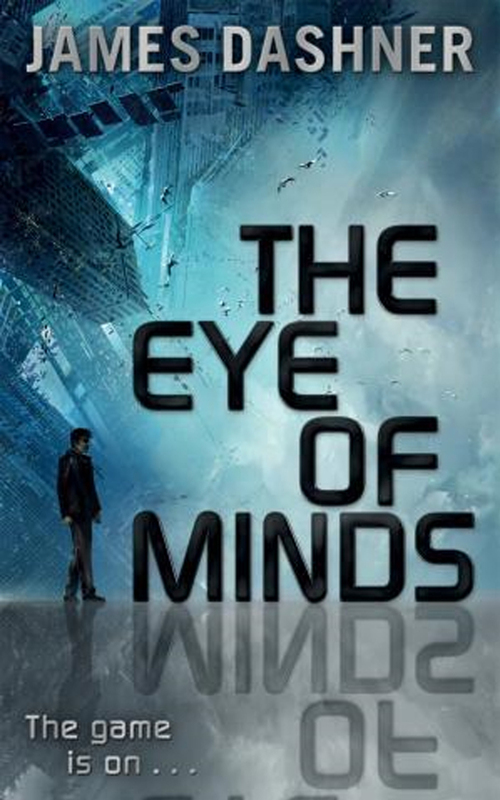 April asked me to read and review “The Eye of Minds,” because she knew I was a James Dashner fan. I won’t lie, I was a little apprehensive going into this. I hadn’t read any James Dashner�in years and wasn’t sure what to expect. Despite my hesitation, I began the journey into “The Eye of Minds.” The book starts out with a gamer, Michael, trying to save Tanya from jumping off of a bridge and killing herself in the VirtNet. Dashner�doesn’t beat around the bush, it was action on action from the get go. The VirtNet�is a virtual world where you can be whoever you want and basically do whatever you want. In order to enter the VirtNet�you have to enter your coffin from the real world, think Avatar. If you die while in the VirtNet, you feel all of the pain of the death but wake up back in the real world in your coffin. There aren’t any real consequences outside of the virtual world. What made the scene with Tanya so poignant was that she had ripped out her core. If you don’t have your core in the VirtNet�and die, it will be for real. You will not wake up back in your coffin. Michael becomes exceedingly anxious and desperate to stop Tanya from jumping to her death. She explains that she will not let Kaine control her and that killing herself is the only way to achieve this. Nothing makes sense to Michael and he grabs onto Tanya to stop her from propelling forward but that just causes him to fall with her. A few minutes later, Michael is transformed back to the real world and seriously confused. You see, Michael is a great gamer in the VirtNet. He has honed in on his skills in manipulating code and defeating different programs. He decides he wants to have an extra life in a new game he is trying out? Easy. Michael searches for a weak spot in the code of the game and programs himself an extra life. I have to say, if you don’t understand what code is and have never really thought about how a virtual world would work, this book may be a little difficult for you to get into. For me, this was right up my alley. I’m not afraid to admit that I delved�into “Second Life,” for a while during my college career. New technologies and video games are fascinating to me and I do think that virtual gaming is in our future. Keeping that in mind, “The Eye of Minds,” is a great first novel in James Dashner’s new trilogy, full of action and suspense. Michael wakes up from the “Sleep,” (VirtNet) and immediately�tells his best friends from the VirtNet, Bryson and Sarah, that they need to meet up in the virtual world as soon as possible. Michael is completely unnerved�from the suicide he witnessed in the VirtNet. Eventually, he is confronted by an agent from the VNS, an entity meant to protect the virtual world. The agents kidnap Michael off the street in the real world and send him to an underground security hub. He meets with Agent Weber and is told that Kaine is an extremely powerful hacker in the VirtNet�that needs to be stopped. The VNS has been watching Michael, Bryson, and Sarah and believes they are strong enough hackers to take down the infamous Kaine. If Michael and his friends are successful in taking down Kaine, they are promised a lifetime of happiness and prosperity. The agent also makes a vague threat to harm Michael’s family if he does not cooperate. Thus begins the journey into the unknown realms of the VirtNet�with Michael, Bryson and Sarah. I loved this trio of characters together. Their humor and candor reminded me of my friendships. There is no dreadful love interest, just three friends trying to save the virtual world together. The remainder of the novel is fast-paced and intriguing. The delightful trio must battle their way through the virtual universe�manipulating code�as well as using their�logic skills to find Kaine. I found myself trying to predict what would happen on every page. Sometimes I was right, but mostly I was wrong. “The Eye of Minds,” is great at creating a mysterious and suspenseful tale. I did not see the ending coming at all and�I was shocked to learn the secret behind Michael. One of the things that I really enjoy about James Dashner’s novels is how he sets them up. Each chapter is broken down into numbered sections that are never more than a few pages. This leads to easy and quick reading for me. “I’ll read one more section,” turns into reading three chapters. This style of splitting up the novel really works with all of the action. My only qualm with “The Eye of Minds,” is that at times there was too much action. I would have liked to have a little bit more character development. However, this doesn’t stop from making the book a great first entry into a trilogy. I can’t wait to read the next novel and learn more about the brilliant�world that James Dashner has created. If you like fast-paced action novels with an emphasis on friendship, give this one a read. I promise you won’t regret it! I’m not quite sure how to feel about this one. Though I read and enjoyed The Maze Runner trilogy, I thought Thomas (the MC) was too whiny and annoying. I found the supporting crew to be far more interesting and, honestly, it was the action that kept me going. The Eye of Minds has gotten some mixed reviews and because of that and the fact that I only liked his other books, I’ve been on the fence about Eye of Minds. But since I am one of those people who really enjoys action-y books sans love interests, maybe I will give this one a shot. I have to agree with the Maze Runner trilogy. I liked it at first but then I found myself getting sick of Thomas too. I wish he had gone into more detail about the secondary characters. I was really apprehensive about Eye of Minds at first, but I realized I was prejudging it based on his other novels. Once I got out of that mindset, it was great, fast-paced novel. If you have the extra time, I would give it a shot! Like you, I was surprised by how much I enjoyed THE EYE OF MINDS. While I only liked MAZE RUNNER – I listened to it on audio and it made me entirely too tired for my road trip – I was really sucked into this newest book. I’m hoping that, once the movie version of MR comes out, more kids pick up THE EYE OF MINDS. To me, it has the potential to pull in reluctant and seasoned readers! Right?! I really enjoyed the overall theme of the Eye of Minds. Oh, I completely forgot they were making a movie about it! I bet it could make an awesome film if they have a good screenwriter. I agree, I think kids will be intrigued by the whole virtual world aspect!